When I have more time to potter in the kitchen, I make proper traditional vegetarian roast potatoes, but as it was an after work evening, I make what I call quick baby roast potatoes. I peel and cut the potatoes into rough cubes, so that they cook in half the time. However I made these baby roasted potatoes with a bit of difference. In the last 10 minutes of roasting, I drizzled over some balsamic vinegar and sea salt inspired by a recipe I saw in one of Rose Elliot’s book. 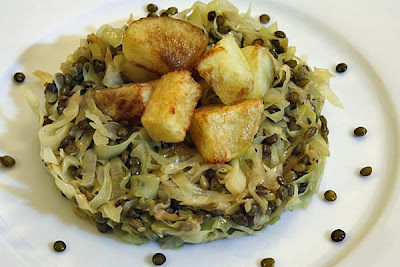 And for the puy braised cabbage, you can find the recipe here, but you will have to cook the puy lentils first. Simply boil them in salted water till tender, then drain before adding it to the braised cabbage. 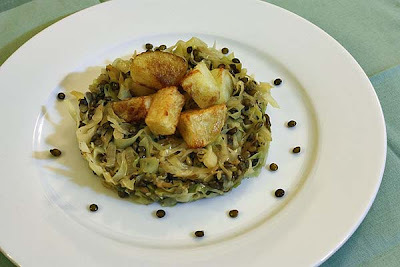 This is such a simple, yet flavourful meal: the sharp twang of the balsamic vinegar and the nuttiness of the puy lentils against the slow braised cabbage hit the spot after a blustery and wet walk home in the rain. If you don’t want to make the balsamic potatoes, just eat the braised cabbage with mash potatoes. You know what?! I think I may have found my favourite way to eat cabbage. Now what to do with two red cabbages?! 1/2 a stick of butter, 1 head of cabbage (about a kilo or a bit less) sliced nice and thin, 6 tablespoons of sugar (75 grams), and 150 ml of balsamic vinegar. Melt the butter over medium heat & saute the cabbage until it starts wilting, add the sugar, coating the cabbage evenly, add vinegar, reduce to medium-low. Cover and simmer the cabbage until it is tender (about 30-35 minutes). Remove the cabbage, season with a pinch of salt or pepper. It's a simple recipe that tastes great. A good alternative is brown sugar instead of traditional sugar. Tweak the amounts to your desired taste. My family immigrated to the US from Russia before I was born. This was a pretty common dish from both of my grandmothers. There is an Irish dish, colcannon, that combines mashed potatoes and cabbage. It is a serious side, one of my favorites! Be glad you don't have crisco, it destroys arteries. MMMMMMM,...This filled plate of fine food sings to me!! Thanks for leaving a lovely comment on my foodblog so that I could discover yours!! You have a COOL foodblog!! My father grows in his garden a lot what I want & one day I would like to have a vegetable patch in my garden! I already grow salad leaves, herbs & celery in pots! My favourite veg, cabbage and potatoes! Who needs a cook book when I can just visit bloggers like you! You will be delighted to note that I have made your GrandMa's recipe. It was really really delicious. I am aware of the delicious Irish colconnon dish. I have made it a few times. It is so comforting. You are so welcome Louise. Thank you so much or stopping by my bog too. Thank you so much Sophie for coming by. Even though it may seem a little growing salad leaves, its great growing you own, so much more rewardign and flavourful. I am amazed to learn that you grow celery in pots, I must give that a go next year. Now that sounds really good. Roast potatoes are something I never make, but I do love them. They are usually a treat to enjoy at my parent's house. The balsamic vinegar really is a delicious touch, that's of course if you like the sharp flavour. Puy lentils are probably my favorite kind of lentils, they really work well in salads, too. This sounds like the perfect winter dish. Thank you so much for coming by Alice. Puy lentils really are the king of the lentil world! My apologies - it was one of your followers who visited and commented - but I'm still glad I found your blog! Absolutely fine Kate and Welcome.